National flag day in Slovyansk. (Augusst 23rd 2014). 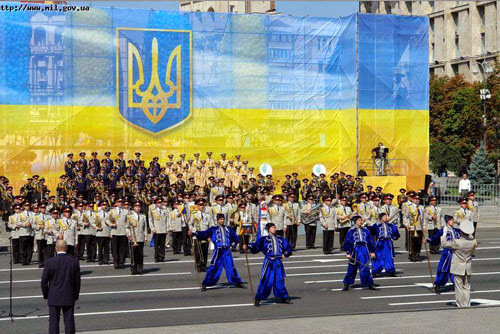 KYIV, August 23 / TodayUkrainians celebrate Flag Day.This holiday has appeared thanks to the signing of the corresponding presidential decree in 2004. At that time, Leonid Kuchma was head of the state. Until 2004, the Ukrainian Flag Day was celebrated only in Kyiv as a municipal holiday. The flag is a symbol of the Ukrainian statehood. It is described in detail in the Constitution. After independence, the state flag of Ukraine consists of two equal parts of blue and yellow colors. The ratio of the flag's width to its length is 2:3. Such standards are enshrined constitutionally. The blue and yellow flag was raised over the building of the Verkhovna Rada of Ukraine, August 24, 1991. It was the day when the act of the country's independence was proclaimed. The National Flag has a long history. From the time of the baptism of Rus, blue and yellow colors are always present on the banners of the Ukrainian state of different ages. Almost of the same form, as we see it now, the Ukrainian flag was raised in Lviv in June 1848. The blue color on the flag of Ukraine is a peaceful sky and yellow - wheat fields. Dobropillya (Hard to be a patriot at the Donbass :). Garry Kasparov: It’s a War, Stupid!